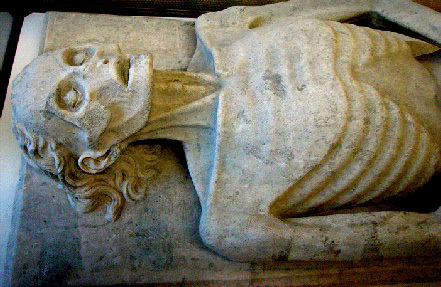 The cadaver monument of Guillaume de Harcigny (d. 1393), formerly at the Franciscan church now Musée de Laon (France) (église des Cordeliers) on a slab, 1.84 m in length. 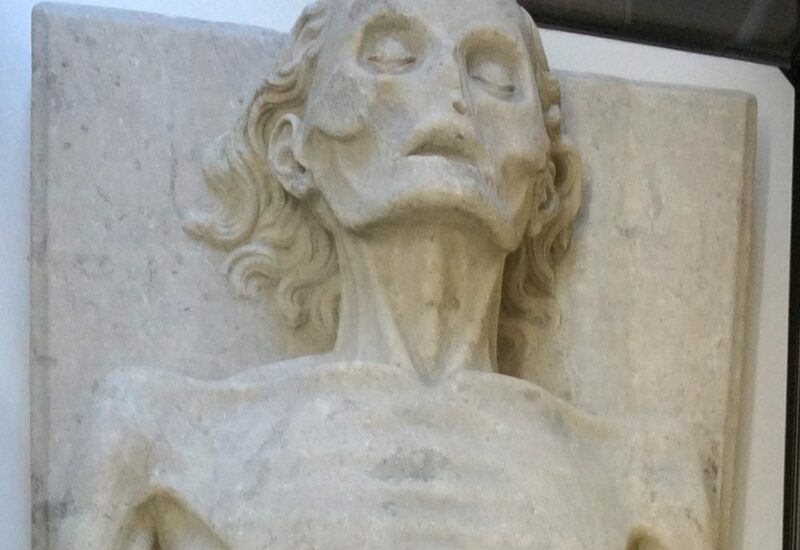 The transi or cadaver monument of Guillaume de Harcigny is of great interest to historians and art historians alike for a number of different reasons. 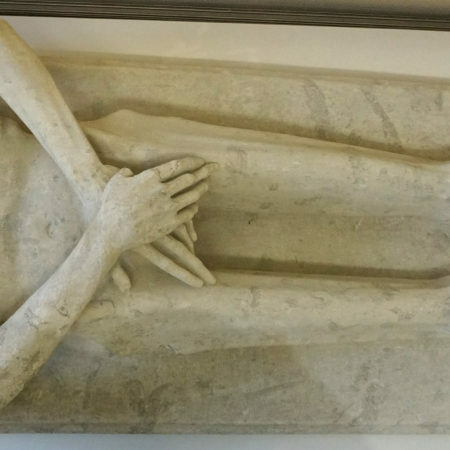 Cadaver monuments began to appear in the later fourteenth century, which makes this one of the earliest examples. 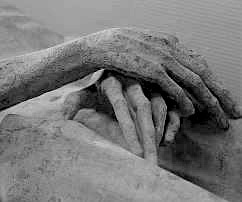 Of the original monument only the effigy survives, which is remarkable for its realism and anatomical detail. The customary shroud is absent. The corpse is shown naked and emaciated, but with the skin still intact and stretched taut across the skull and skeleton, while the muscles can be clearly observed; the crossed hands cover the genital area. Carved in limestone, it would originally have been painted in realistic colours. 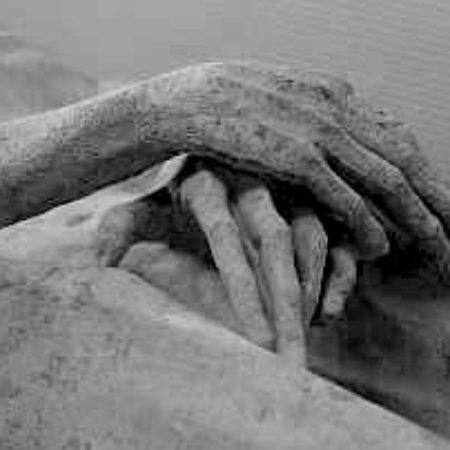 Cadaver monuments were designed to be a statement of devout humility as well as of a firm belief in the resurrection as expressed in Job 19:25-26: ‘For I know that my Redeemer liveth, and in the last day I shall rise out of the earth. And I shall be clothed again with my skin: and in my flesh I shall see my God.’ A biblical comparison is Ezekiel’s vision of the Valley of Dry Bones (Ezekiel 37:1-14). The macabre appearance of the effigy is thus a deliberate reflection of the inevitable fate of the flesh as opposed to the immortality of the soul, which is in accordance with the medieval contemptus mundi tradition. The monument is also important because it commemorates a highly unusual individual who made his mark in history. Guillaume de Harcigny was born near Laon around 1310 and made his career as a physician. Yet he was not the stereotypical medieval quack, but a man who obtained his degree from the University of Paris and then travelled to Italy and the Middle East, increasing his medical knowledge before settling in Laon. When the French king Charles VI (1368-1422) suffered his first bout of insanity (probably a form of schizophrenia) on 5 August 1392 while on a military campaign against the duke of Brittany, the octogenarian Harcigny was summoned from Laon to treat him. The chronicler Jean Froissart (who gives his name as Guillaume de Harselly) describes in detail what happened next. Harcigny’s diagnosis was that the young king was affected by ‘tourble’ (trouble or agitation) and a weakness of the head, and also took ‘too much from the moisture of his mother’, i.e. he had inherited her temperament. Charles was taken to the castle of Creil where in Harcigny’s care he slowly recovered through sleep, relaxation, exercise and fresh air. Upon delivering his patient back to his family, Harcigny counselled the king’s uncles not to burden him with the affairs of state but to allow him to regain his strength. He was awarded a thousand gold crowns and returned to Laon where he died a very rich man on 11 July 1393, leaving his home town generous bequests. Guillaume de Harcigny left instructions about his burial in his will. His cadaver effigy was probably produced the year after his death. He was buried in the church of the Cordeliers until the building was sold and demolished at the time of the Revolution. 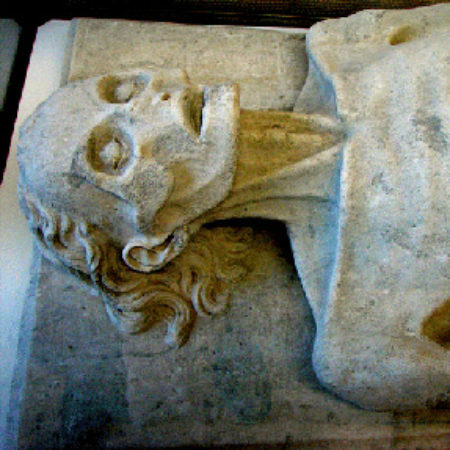 His effigy and remains were then moved to Laon Cathedral and buried in the floor of the nave, only to be unearthed again in 1841 – almost like a resurrection, but not quite: the lead casket with his remains was subsequently lost, but the effigy was transferred to the museum in 1853. ● Cohen, K., Metamorphosis of a Death Symbol: the Transi Tomb in the Late Middle Ages and the Renaissance, California Studies in the History of Art, 15 (Berkeley/Los Angeles/London, 1973), esp. pp. 103-4, n. 20, and figs 1-2. ● Froissart, Jean, Œvres, ed. M. le baron Kervyn de Lettenhove (Brussels, 1867-77), vol. XV, pp. 48-53, 76-78, available on http://gallica.bnf.fr). ● Taburet-Delahaye, E. (ed. ), Paris 1400: les arts sous Charles VI, exhibition catalogue (Paris, 2004), cat. 158. ● Tuchman, B.W., A Distant Mirror: the Calamitous 14th Century (London, 1979), chapter 4, ‘Danse Macabre’. ● Wickersheimer, E., Dictionnaire biographique des médecins au Moyen Âge (Paris, 1936), 246-47.